The Missus is a tea drinker and I like cranberry tea. It's rare in these parts, but it's a treat even I enjoy. So when we're out on Cape Cod I don't mind picking up a box or three. Well, anyone that knows me knows that I seldom throw anything away that looks even remotely useful and these little wooden boxes have been sitting around empty for some time. As you've already figured out from the pic, they make Absolutely Perfect storage boxes for your detail parts. They're just the right size for most packages of detail parts. Why does Precision Scale have to go and be different? Ah well - just store those facing the other way. 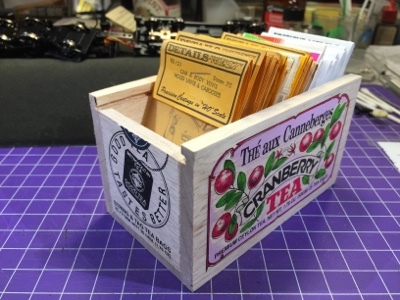 If you're a tea drinker and a modeler, I highly recommend the Metropolitan Tea Company's Premium Cranberry Ceylon Tea - in the "Decorative Wooden Box" of course. Just six bucks on eBay - and you get 25 bags of tea to enjoy in addition to a very cool storage box (it even has a slide-on lid!). Let me know if you try out this tip - and, if so, what you think! I JUST made the first pass organizing my detail parts and ended up with a dozen or so of those detail part packets. I will have to keep my eyes peeled for a similar sized box...though cranberry tea sounds nice.